WOW! I can see lots of ingredients in that large pot. 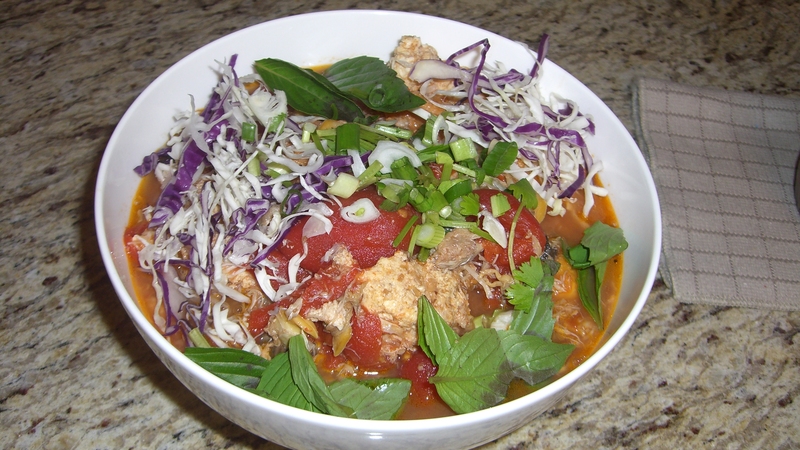 Never tried Bun Rieu before, please share some with me. I love Vietnamese beef noodle with lots of basil leaves. Lequan, I must be honest with u….. I’ve never seen such noodles before. 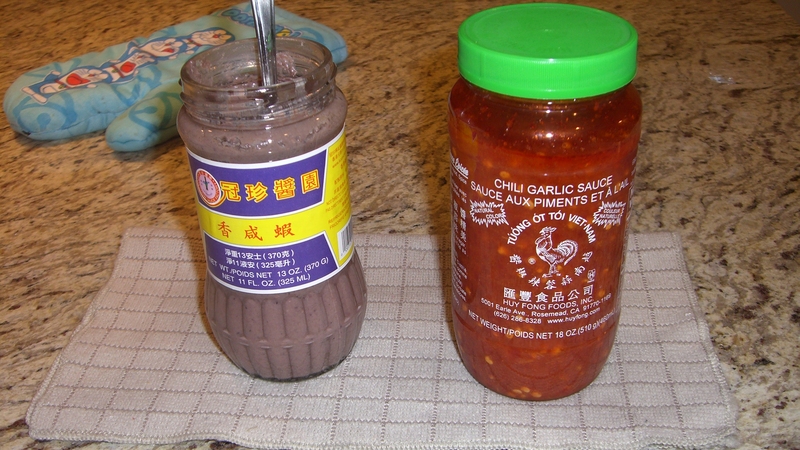 Wow, adding shrimp paste in soup?? 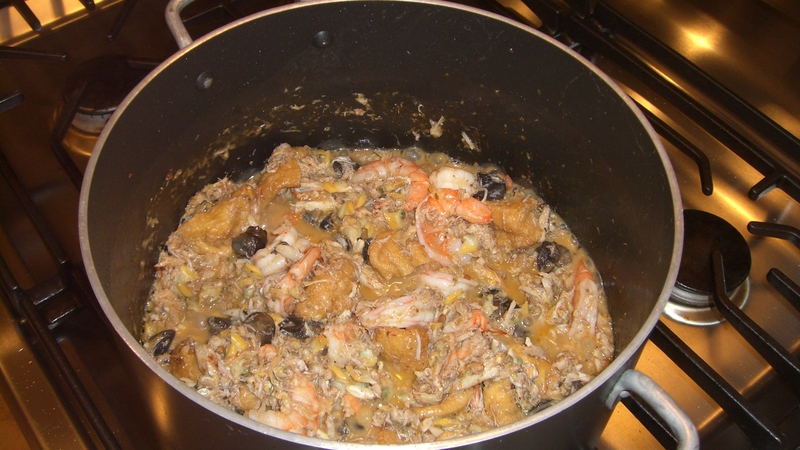 It’s amazing what u came up with mixing all the can food with seafood. Keep one bowl for me pls? Oh, good luck to your challenge! This dish sounds super tasty! Love that picture of your husband with that big bowl!! This looks fantastic LeQuan! I love soupy noodles and all the goodies you’ve included in your recipe must make this the tastiest soup ever! YOU CANNOT have a secret ingredient when you are posting a recipe!!!! This looks outstanding and excellent directions – except – in the end you say “secret ingredient” where did you add it – what is it? Are you pulling my leg? You are not a secret girl! Please e-mail it to me… and the prawn egg idea is wild and not too much work. I am sure it is excellent. I love learning things like this. 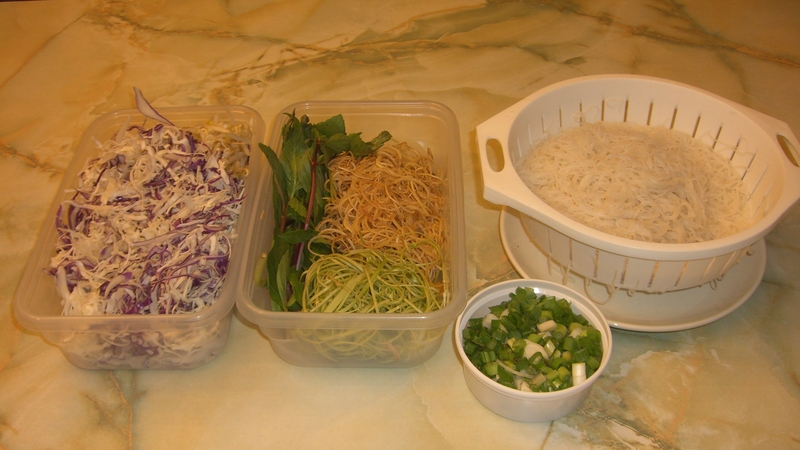 And this soup might be easy for you – but so foreign to me… to make, not to eat – but I love the recipe and the pics and the instructions… and, I love all Vietnamese food I have ever eaten, especially those little green leaves that start with a P.
Lol Valerie! The secret ingredient is on it’s way in your email ;-). Oh gosh I love your enthusiasm. Man that is a flavorful bowl. 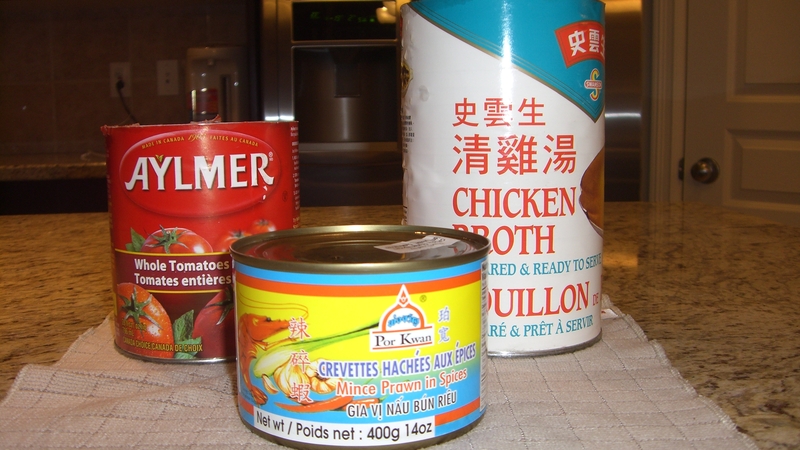 Shrimp paste, clams, escargot, crab meat. Fantastic flavor profile. 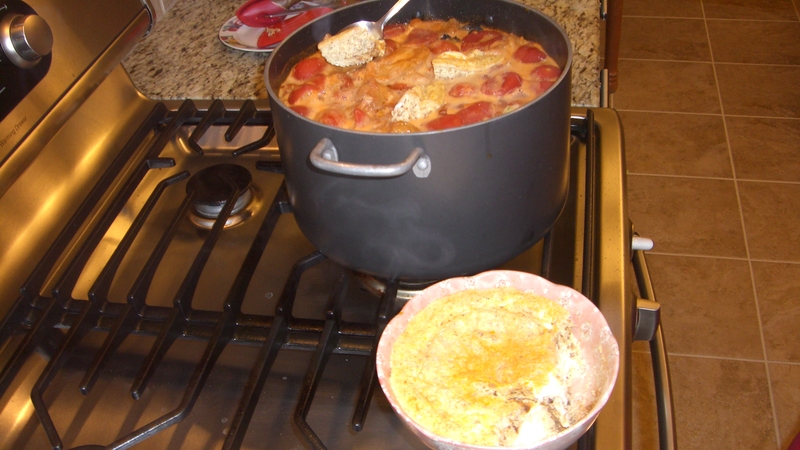 The secret ingredient is a smart additon, I can see that it would certainly improve the overall flavor base. Thanks for accepting the challenge and producing such a creative dish. That bowl is huge by the way. Much props to the bottomless pit for rocking lots of tasty Bun Rieu. Wow, this soup is just loaded with goodies 🙂 Great entry! I love noodles! I can’t believe how many amazingly unique ingredients you’ve used in this dish. Shrimp paste? Escargots? No wonder Gary’s bowl is bigger than his head! I’m so glad you partake in the challenge LeQuan! 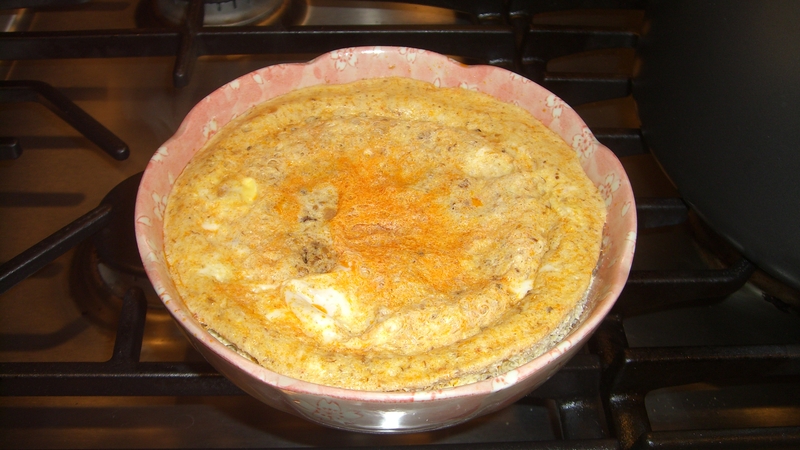 Once I saw the photo of it, I recalled that my mom and grandma used to make this! I didn’t recall from the name because I have no idea what it’s called haha. Is it the soup you have when you are sick? You told me in my sick post. It looks good and will def’ cure the sickness. Best of luck to you LeQuan! No this is not the soup that I was talking about. That’s “Bun Bo Hue”. It’s almost like pho, but it has a spicy broth. I’m going to post the recipe some time. 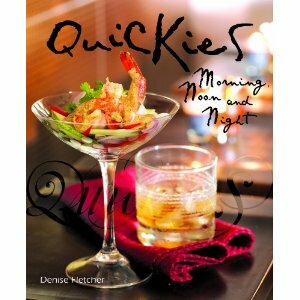 Dear Le Quan – You are ahmaazing to put up this splendid production for Denise’s competion. FANTASTIC ingredients and flavors. So lovely and oh so delish! I definitely like the Spring Roll and the dry rice vermicelli and the deep fried shrimp paste…so good but can’t have too much..LOL. I don’t think I’ve ever seen any Bun Rieu dish in any Vietnamese restaurants..mostly are Pho here. That’s quite a big bowl of soup your hubby having! Hey LeQuanis! 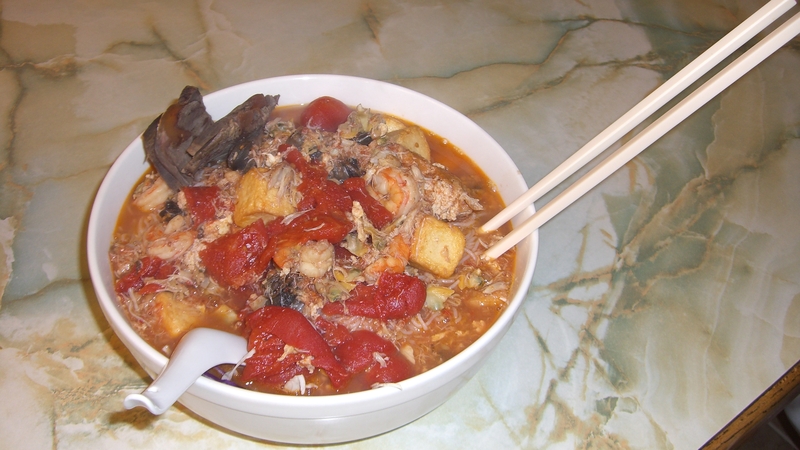 I have no doubt that this bun rieu soup will be my favorite entry into The Quickies challenge. I mean that too;) I love Vietnamese food. If it were a voting challenge, you would totally have mine! You know, I used to work at a French restaurant when I was a teenager. My manager was a young Vietnamese woman. She would always bring me, my sisters, and our friends to the Asian sector of Atlanta (Buford Highway area) to this tiny Vietnamese restaurant. Everyone would look at her real funny like when she walked in with a whole boat load of little white kids (teens). They were always really nice to us though and we, of course, ate all kinds of delicious Vietnamese soups. Point is that I’m pretty sure I’ve seen this soup before, and it did not look nearly this good. I’m with you on the extra seafood-that makes it such a treat…! p.s. I need to get a can of that minced shrimp. I bet that makes so many soups all the better. p.s.s. that bowl is for real bigger than Gary’s head;)! Sha right! Like a camera is going to stop you. Hey LeQuanis! No, I didn’t do anything different. Maybe there’s just less blog traffic over the air waves today:) Maybe. 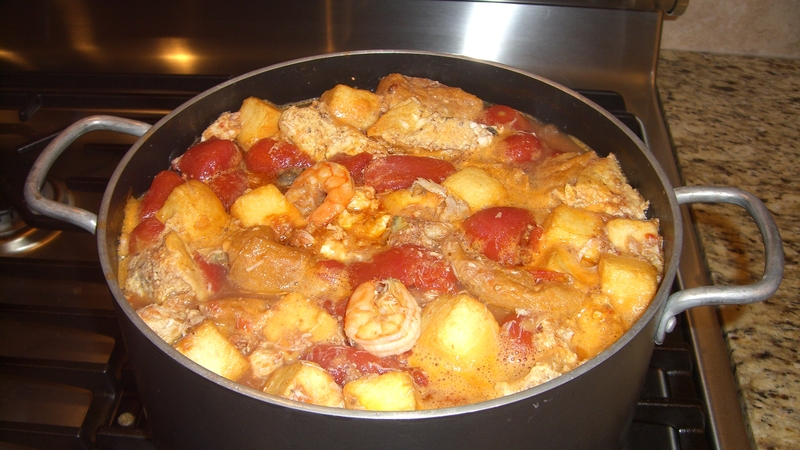 By the way, I think this tomato soup would be excellent with some shrimp thrown in the pot during the last 3-4 minutes of cooking. That would be very LeQuanis-esque (smile). Hope you guys have a great weekend, my LeQuan. Wow, this looks like an amazingly delicious specialty! Sounds incredible with all the seafood you use and the flavors must be just fantastic. I would sure love to have one of those gigantic bowls! This looks so delicious. I adore tomato based soups/broths, and I love seafood so I know I would be smitten with this pasta bowl. The flavors must be amazing! By the way…your husband is just precious. He is a handsome man with a caring heart (I can tell just be looking at his photograph!) We are both lucky women. Thank you so much for sharing. I hope you have a lovely Friday! 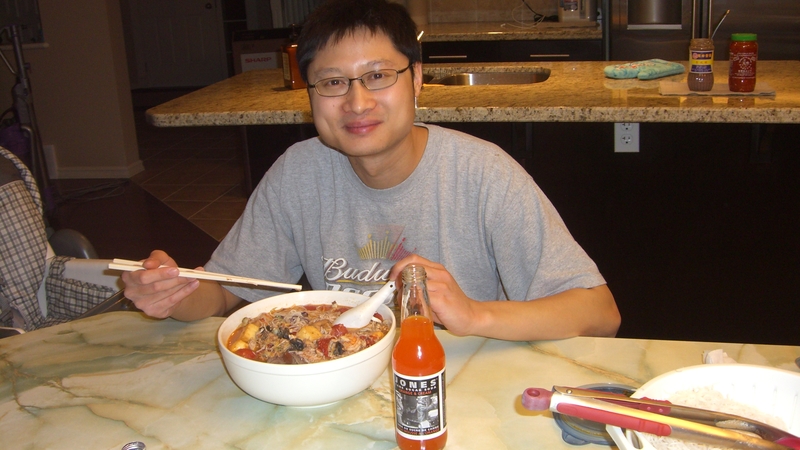 lequan,don’t even let me know the secret ingredient, I am gonna hop on the plane to come to you for a bowl of the heavenly noodles..may I have your address please? LOL! Oh wow….that’s a lot of lovely ingredients there! I’m so amused to see your hubby and his big bowl of noodles. That’s really a huge bowl. It would be more amusing if that bowl is in front of you…haha. Or even more amusing if in front of your boy 😀 Thanks very much for sharing that lovely noodle dish. I love the Vietnamese beef noodle soup and also the Vietnamese pancake…mmm…so delicious! Wish you luck on this noodle contest! what a flavorful soup bowl! I love seeing foods from other cultures, I have to say I am not as well versed at noodle bowls as I should be…yours looks positivley delicious! I love the idea of a secret ingredient!! for years it was why my dishes were so hard to repicate! Hope you are having a wondeful weekend! Boy oh boy, I can see this dish making its way to the top of the contest list!! 😉 What a fantastic combination of flavors, LeQuan! The prawns, the fried bean curd, the escargots … mmm. I love escargots. In fact, I love ALL of those ingredients!! Except: what is fish tofu? If that tofu with fish sauce in it?? I don’t think I’ve ever seen it before. And, SECRET INGREDIENT! What is it what is it what is it?? Oyster sauce? Lobster?? 😛 I must know! Pretty please! I’ve seen that exact shrimp paste in the Asian grocery and never really thought about the fact that it’s purple … why is it purple?? :O I love the idea of the minced prawn and egg chunks in the soup and I can see how that would totally make the dish. Did you come up with that idea? Luv it! Also love the pic of Gary aka Hungry Hubbie aka wetcoastwannabe with that enormous bowl of noodles. I don’t think my stomach is anywhere near that large! Fish tofu is basically fish balls shaped like squares of deep fried tofu. I know, why would you want to make fish look like tofu, right? I don’t have an answer to that, but I do know my kids like to eat them and that’s all that matters…haha. The secret ingredient is on it’s way in your email ;-). 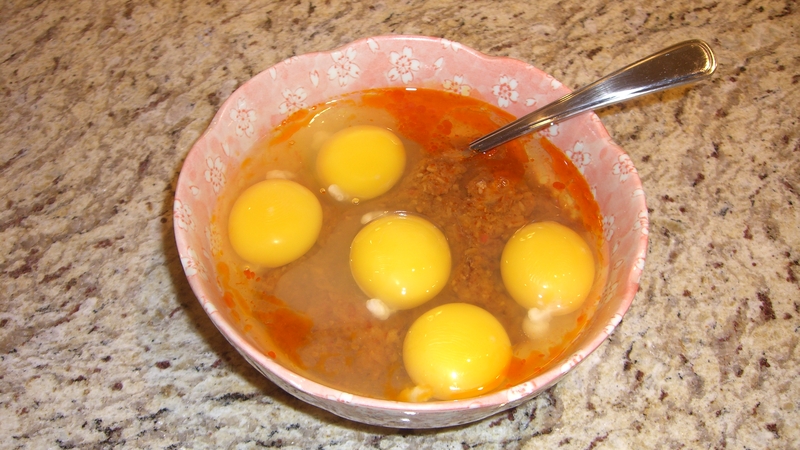 The minced prawns with eggs is actually an adaptation. Usually it’s done with ground pork, but because I don’t eat pork, I left it out. Hope everything is going smoothly with the move. You must be so busy with moving and school. Not to mention the chaos of the holidays too. Take care, and don’t forget to leave some time for yourself to just enjoy. Have a great weekend, dear! When you cook, Lequan, you seriously go ALL OUT and make me wish you would adopt me. I thought Vietnamese dishes were simple, but you added so much luxuriant ingredients…you’re seriously the most fantastic, generous cook I’ve “met”! My fave Vietnamese dish…is probably their rice crepes! Oh no, you showed me what true luxury is with your lemons post. I will never forget that. I always think of you when I see lemons now. Great ED post, Sophia! Keep them coming. Your Dad is my hero for standing up against those doctors like that. I may not comment on every ED post, but I do read every one. You’re doing a great thing with these posts! This recipe looks delicious 🙂 I hope you win girl! LeQuan!! My housemate and I have been talking about making Vietnamese ALL TERM!!!! Actually, more specifically, we talked about making Pho, but after learning about Bun Rieu, I think Pho looks so boring now. I’ll ask her and see if she’s up for the challenge! :-))))))))) Thanks for some timely inspiration, LeeQs! Honestly I’m looking forward to my move West so I can have a lot more choices. Here in South Florida, Pho is mostly what I can get.